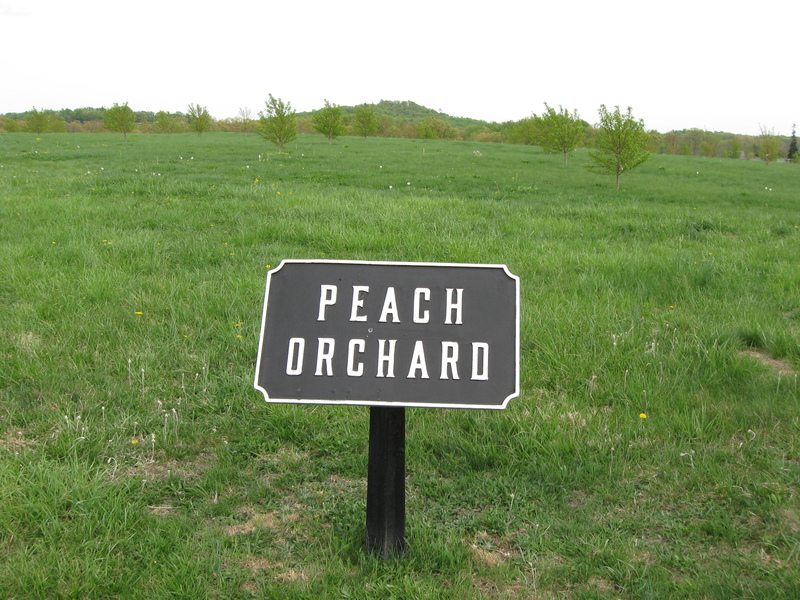 The peach trees in Joseph Sherfy’s Peach Orchard, more commonly known as “the Peach Orchard,” were replanted at the beginning of April, 2008. To our untrained eyes they appear to be maturing well two years later. 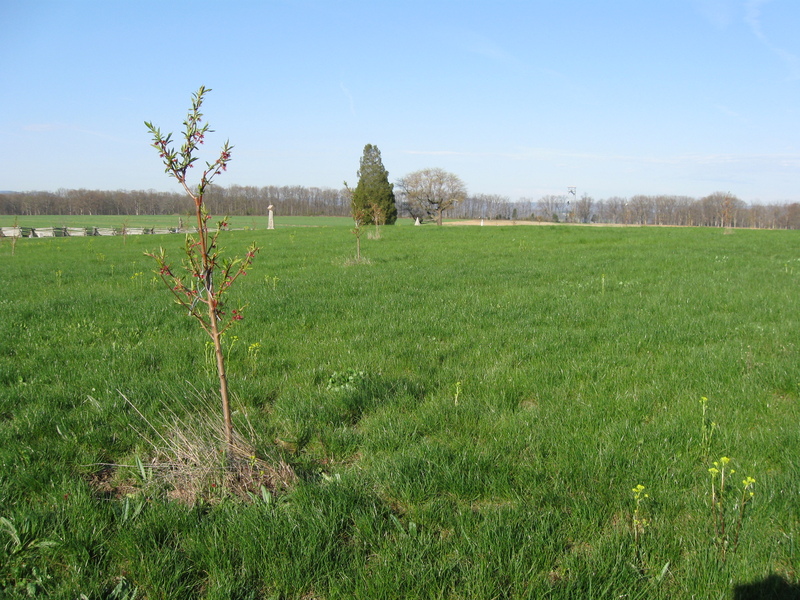 This view was taken from the southwest corner of the Peach Orchard. 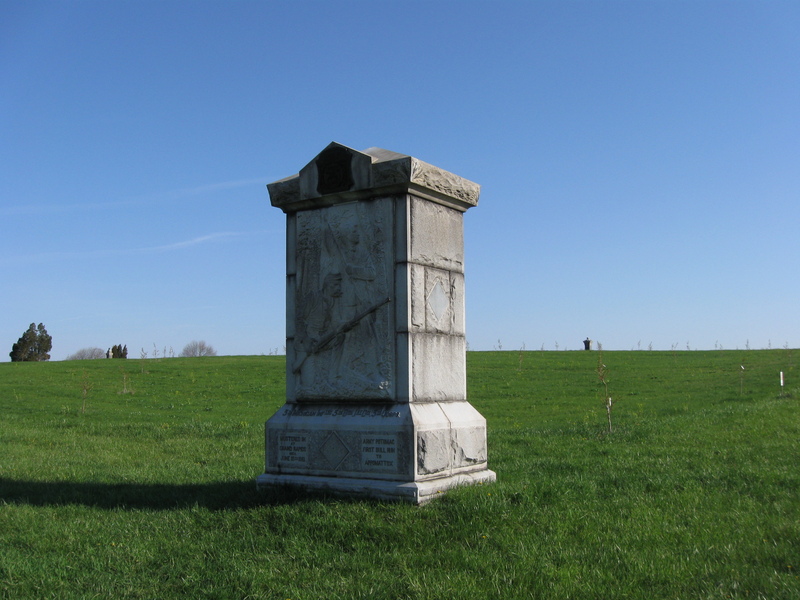 The monument to the 2nd New Hampshire Infantry regiment is in the foreground. 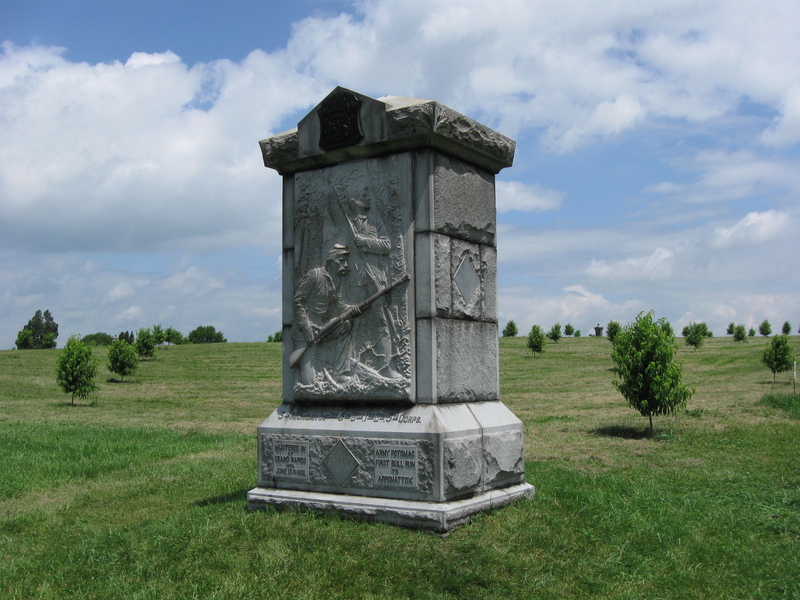 In the left background is the monument to the 141st Pennsylvania Infantry Regiment. This view was taken facing northeast at approximately 4:45 PM on Tuesday, April 20, 2010. 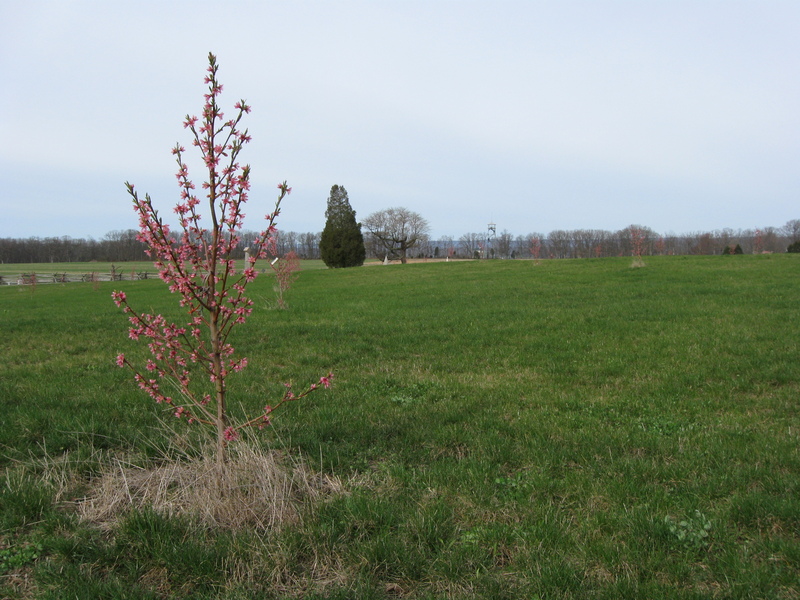 After two years of Joseph Sherfy’s Peach Orchard along the Emmitsburg Road being without trees, the National Park Service replanted approximately 120 peach trees in April, 2008. 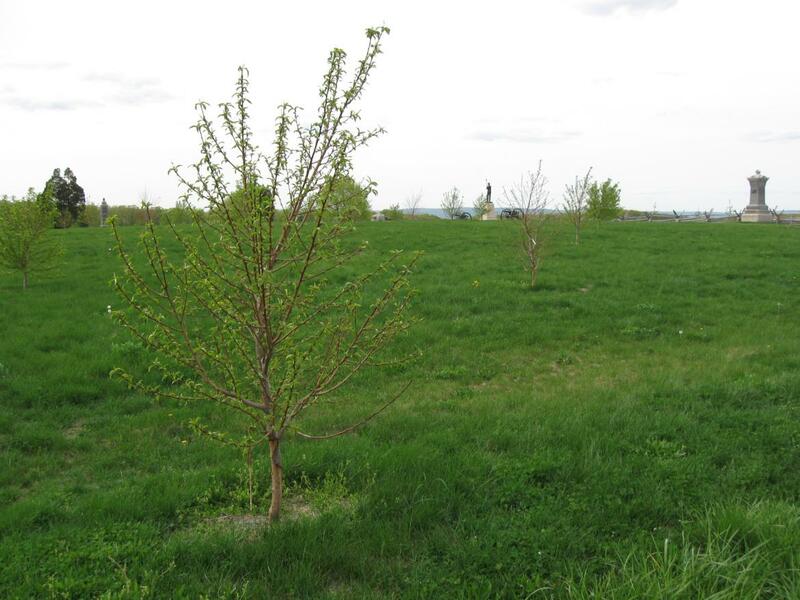 We’ve revisited the Peach Orchard two years later to show you the progress of the trees. 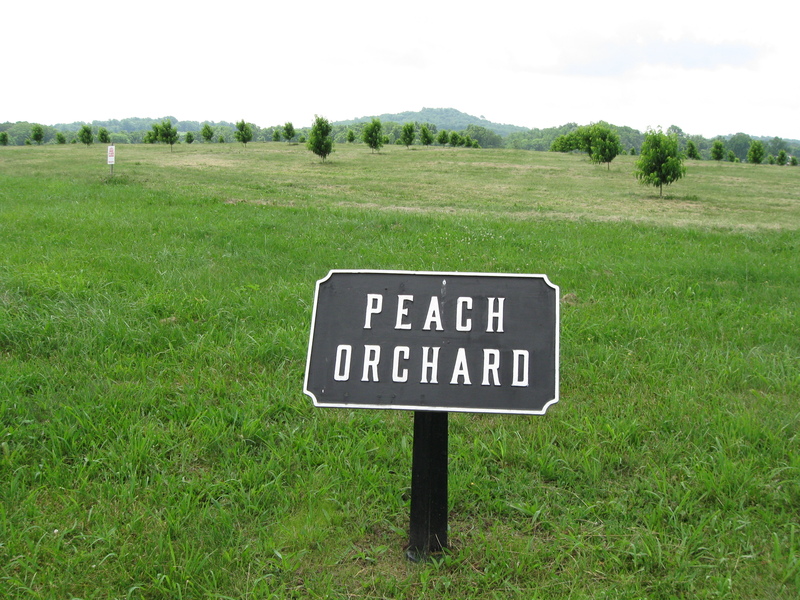 We’ll take a walk around the Peach Orchard, starting at the wayside exhibit at the northeast corner of the Peach Orchard. This view was taken facing southwest at approximately 4:45 PM on Tuesday, April 20, 2010. The Wheatfield Road is visible on the right. 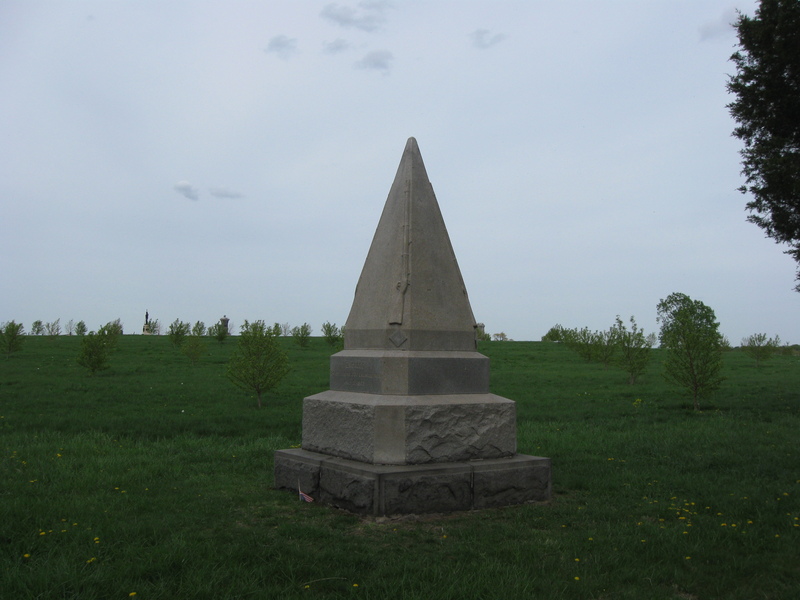 In the left background is the monument to Ames’ New York Battery. 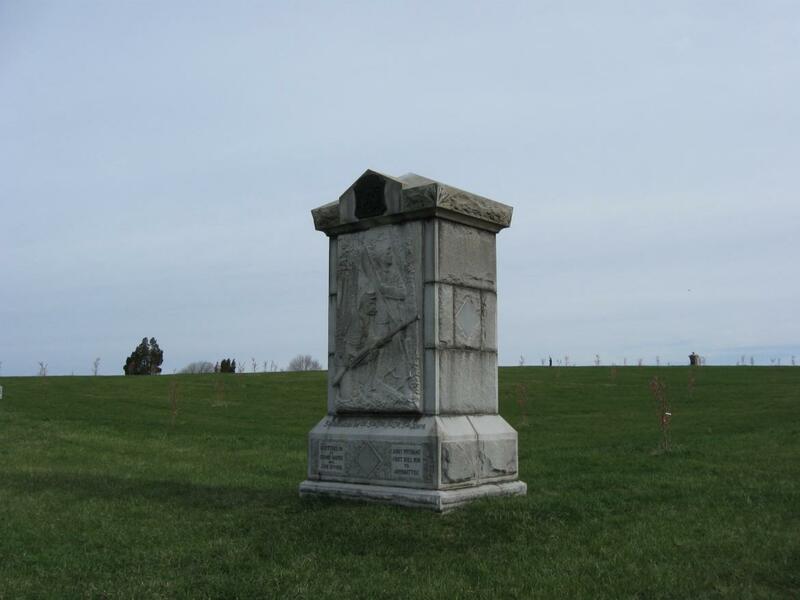 In the center background are the monument to Thompson’s and Hampton’s Pennsylvania batteries. In the right background on the other side of the Wheatfield Road is the monument to the 68th Pennsylvania Infantry Regiment. This view was taken facing northwest at approximately 4:45 PM on Tuesday, April 20, 2010. 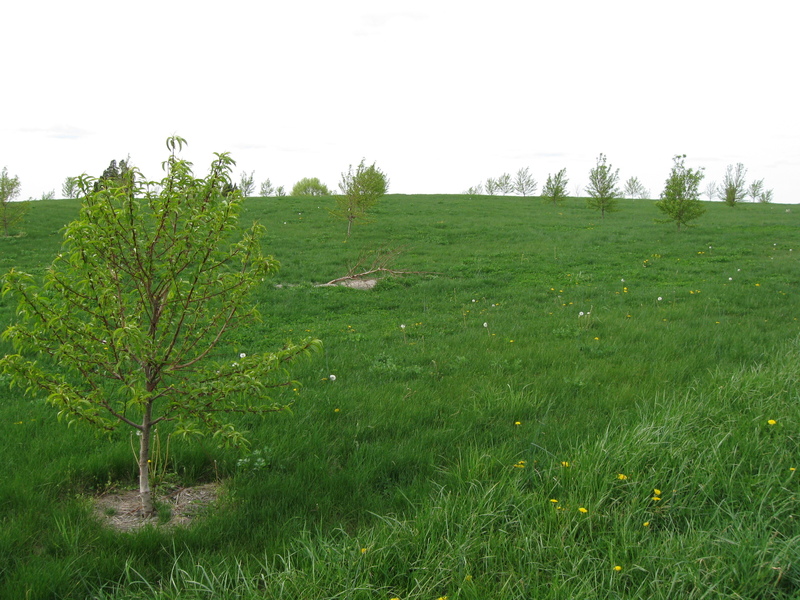 Approximately 120 trees were planted in April, 2008. Two years later, less than two dozen are casualties, such as the dead tree on the ground. This view was taken facing northwest at approximately 4:45 PM on Tuesday, April 20, 2010. Let’s show the progression of some of the trees over the last year. Here is one of the trees blooming on its first anniversary in April, 2009. 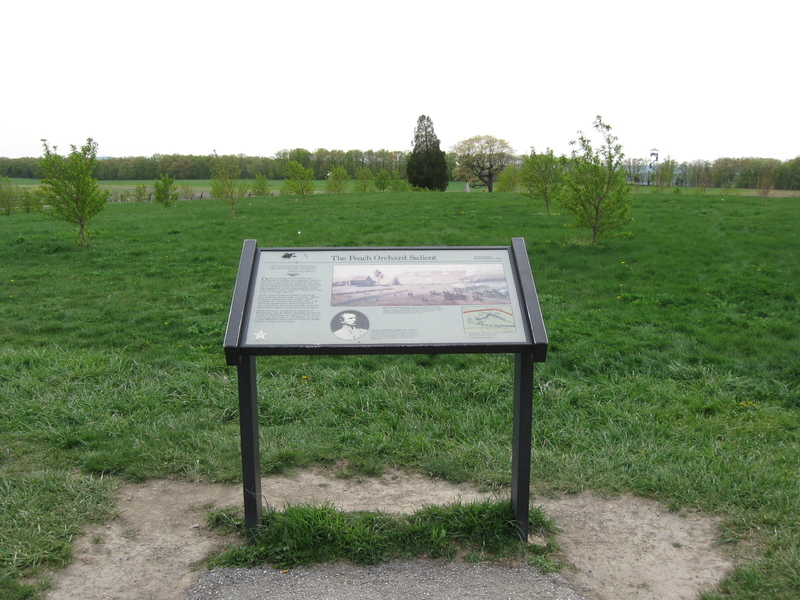 The Longstreet Tower is on Seminary Ridge in the right background. This view was taken facing west at approximately 9:00 AM on Monday, April 13, 2009. The same trees after they stopped blooming almost two weeks later. This view was taken facing west at approximately 8:30 AM on Friday, April 24, 2009. Here are the same trees last June. This view was taken facing west at approximately 11:45 AM on Thursday, June 18, 2009. The same trees today are to the left. We also wanted to show you that the National Park Service has removed the “Area Closed” signs so that anyone can now view the trees and the Peach Orchard up close. This view was taken facing west at approximately 4:45 PM on Tuesday, April 20, 2010. 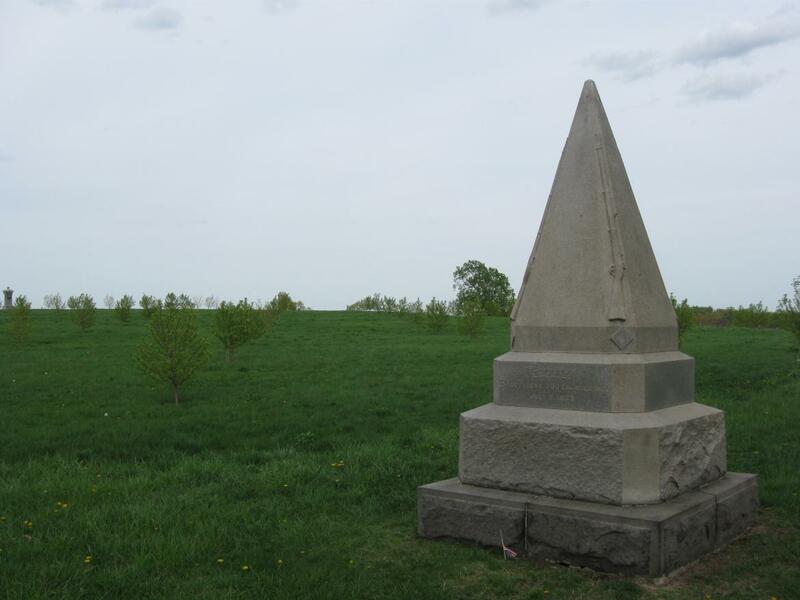 A view of the monument to the Third Michigan Infantry Regiment before the peach trees were planted last year. They were just marked with the pink flags. 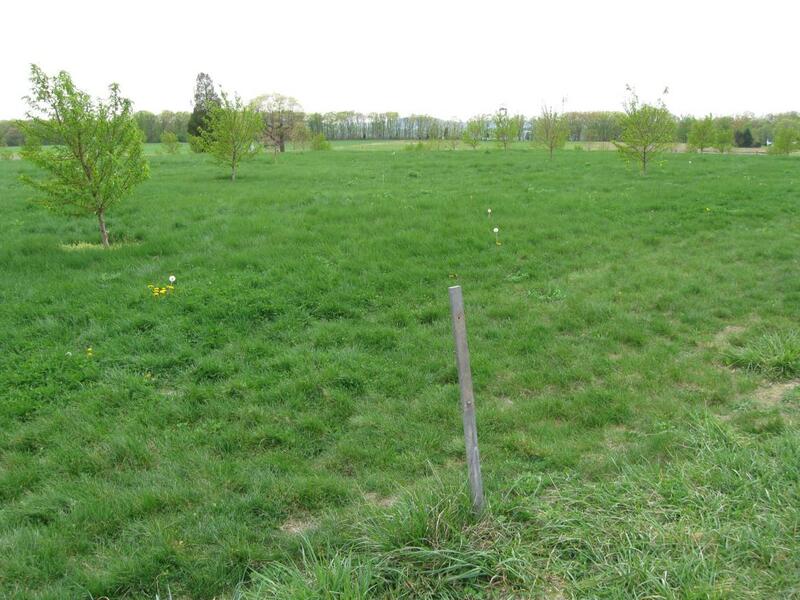 This is the southeast corner of the Peach Orchard. This view was taken facing northwest at approximately 4:30 PM on Friday, April 4, 2008. A year later, instead of pink flags, we had trees with pink blossoms. This view was taken facing northwest at approximately 9:00 AM on Monday, April 13, 2009. At the end of April, after the peach trees stopped blooming. They are blending into the hillside. This view was taken facing northwest at approximately 8:30 AM on Friday, April 24, 2009. Here are the same trees last June. All the rain we had that in May and June made sure that the trees no longer blended into the hill. This view was taken facing northwest at approximately 11:45 AM on Thursday, June 18, 2009. While many of the peach trees have blended into the hillside, one can still get a good view of their shape and maturity. This view was taken facing northwest at approximately 4:45 PM on Tuesday, April 20, 2010. 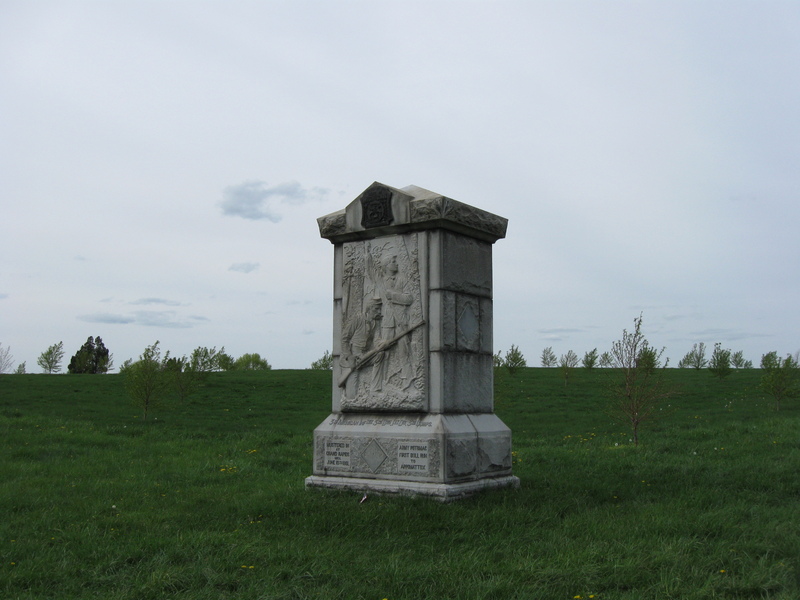 The 3rd Maine Infantry Monument near the southwest corner of the Peach Orchard. 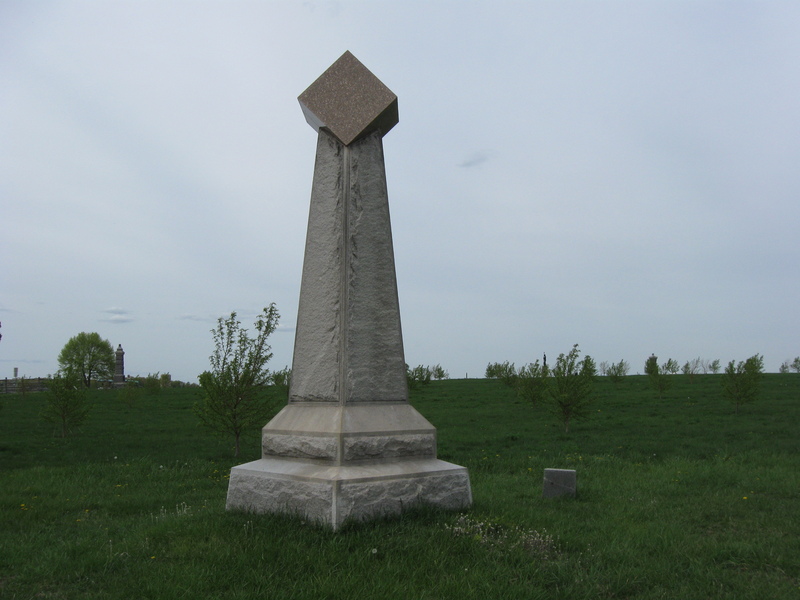 The monument to Ames’ New York Battery is in the left background. This view was taken facing north at approximately 4:45 PM on Tuesday, April 20, 2010. The monument to the 2nd New Hampshire is located in the southwest corner of the Peach Orchard. 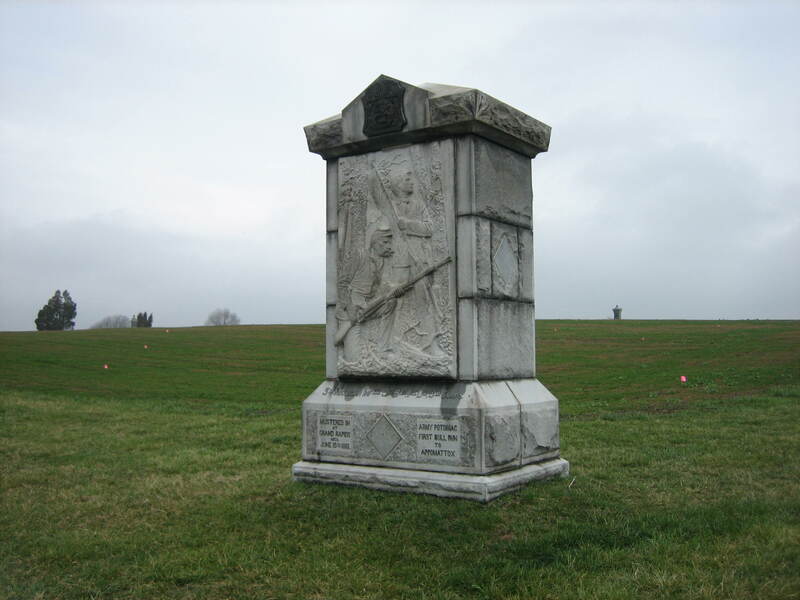 In the background is the bronze statue on the monument to Hampton’s Battery, and the taller monument to the 141st Pennsylvania Infantry. This view was taken facing northeast at approximately 4:45 PM on Tuesday, April 20, 2010. At the northwest corner of the Peach Orchard last June. 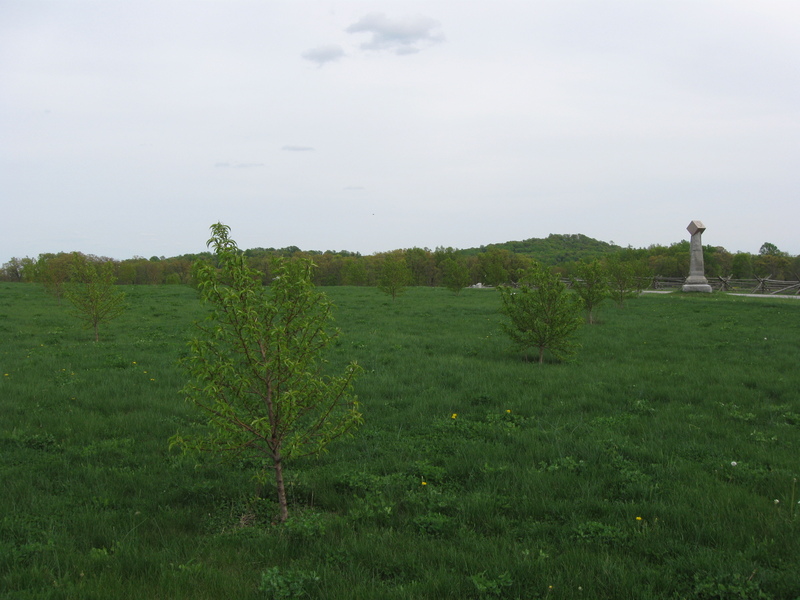 Little Round Top is in the left background. Big Round Top is above the Peach Orchard marker. This view was taken facing southeast at approximately 11:45 AM on Thursday, June 18, 2009. The same view today. This view was taken facing southeast at approximately 4:45 PM on Tuesday, April 20, 2010. Congratulations again National Park Service on completing a worthy project. This view was taken facing southeast at approximately 4:45 PM on Tuesday, April 20, 2010. Peach Orchard and Millerstown Road Updates on April 29, 2009. 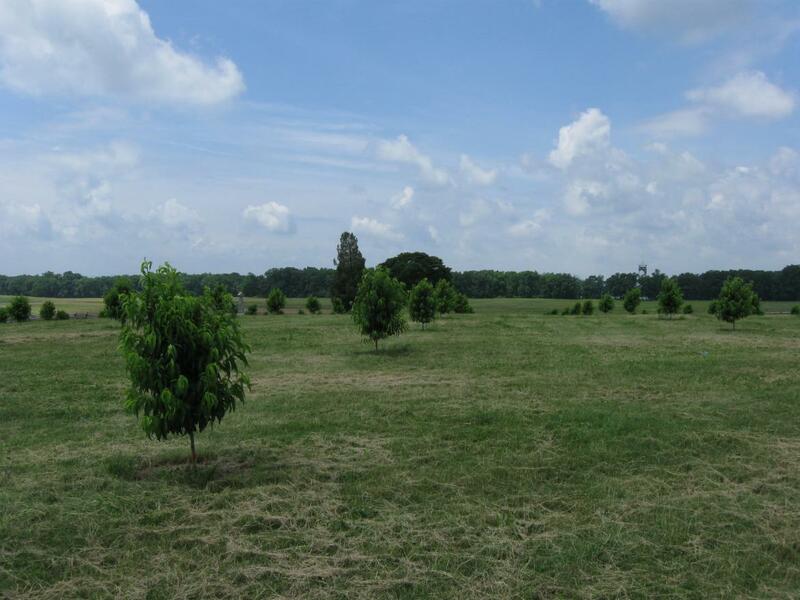 Sherfy’s Peach Orchard Significantly Helped by Recent Rains on June 21, 2009.